Entries from Digital Intelligence tagged with "taiwan"
Apple continues to dominate the mobile app sector in terms of revenue, generating 63% of the sectors revenue through its App Store, compared to 37% from Google Play, according to new research. Apple to quit using Samsung chips? Apple is reportedly planning to drop Samsung as manufacturer of its mobile processors, as the rivalry between the two firms intensifies.A report from Citigroup Global Markets, which is Citi's international research division, indicates that Apple is set to switch to Taiwan Semiconductor Manufacturing for its processing needs. Facebook has launched its App Center in 8 countries, as the social network looks to boost its much scrutinised mobile business. The social network has rolled out the service in United States, Australia, Canada, India, Ireland, New Zealand, South Africa and the United Kingdom. In the coming weeks, the company is launching the App Center to users in Brazil, France, Germany, Russia, Spain, Taiwan, and Turkey. Google’s $12.5bn acquisition of Motorola Mobility has been backed by regulators in Europe and the US. The European Commission ruled the deal would not raise competition issues in the market for operating systems for devices like mobile phones or tablets. Regulators in the US agreed, although both authorities vowed to monitor the company and rivals' use of patents. 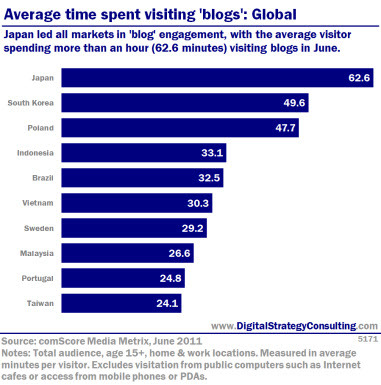 Japan led all markets in blog engagement, with the average visitor spending more than an hour (62.6 minutes) visitng blogs in June. 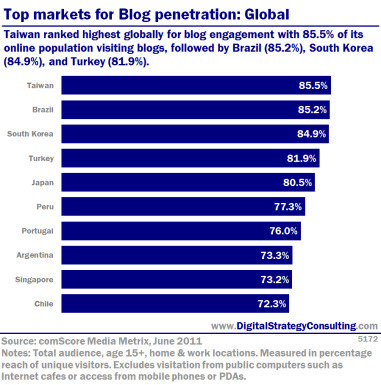 Taiwan ranked highest globally for blog engagement, with 85.5% of its online population visiting blogs, followed by Brazil (85.2%), South Korea (84.9%) and Turkey (81.9%). 4 in 5 Japanese web users visited a blog site during June, according to new data. The study, from comScore, found that FC2 inc, Livedoor, Blog and Ameblo.jp ranked as the most popular blog destinations for the Japanese audience. The report found that in June 2011 more than 80 percent of the entire online population in Japan visited a blog site, as the number of visitors to the category rose 7 percent from the previous year. Taiwan's leading smartphone maker HTC is to buy a British digital multimedia company and invest in a US online gaming firm as part of a bid to expand its software business. HTC will buy London-based Saffron Digital, which enables the delivery of multimedia content to handsets, for £30m, the firm said in a statement to the Taiwan Stock Exchange. HTC has been the most successful of the Android phonemakers and has been investing in teams and companies to enhance its software platform further, trying to keep a step ahead of rivals like Motorola and Samsung.